Warm, white hot chocolate with spices of cinnamon, ginger and nutmeg topped with a cute little kiss of milk chocolate on top and little marshmallows. When it comes to drink hot chocolate I always preferred white hot chocolate. I feel that you can add different spices and/or flavors to it. That is why I chose to make this cookie. In a previous post, last month to be exact I made a hot chocolate cookie using milk chocolate and tiny marshmallows. Here is the link to the recipe, Hot Chocolate Cookies. How do you like your hot chocolate? Do you prefer milk chocolate or dark chocolate or white chocolate? Let me know in the comments. 1. In a medium size bowl, whisk together flour, sea salt, baking soda, baking powder, cinnamon ginger and nutmeg. Set aside. In a large bowl, cream together butter and sugar until light and fluffy 3 to 5 minutes. 2. In a microwave-safe bowl, melt 2 cups of white chocolate chips for 1 to 2 minutes in 30 second intervals. Let cool for 2 minutes before adding to butter and sugar mixture. 3. Add a third of the spiced-flour mixture to the chocolate-butter mixture then one egg. Mix until egg is well incorporated. Add another third of the flour to one egg. Toss the last cup of chocolate chip in the last third of the flour then fold into mixture. 4. Cover and chill dough for 2 to 3 hours. 5. Preheat oven to 350 degrees, line two cookie sheets with parchment paper. Scoop dough out with two spoons or cookie scoop placing them at least 1-inch apart from each other. Baking for 8 to 10 minutes, rotating halfway through baking. Make sure not to over bake them, you want a soft cookie for the kisses. 6. Remove from oven and let cool on cookie sheet for 5 minutes. After cooling place chocolate kisses and marshmallows on to each cookie and gently push in. 7. Let cookies cool for 5 minutes more on cookie sheet before transferring to a wired rack. Let the cookies cool completely before consuming. These sound so delicious and perfect for Christmas! I love that you added marshmallows! I am a huge hot chocolate drinker. And I have many favorite variations. Making them into a cookie sounds amazing and perfect! Aren't these the cutest cookies ever! I would never have known they were spiced just by looking at them! I think they would be lovely with a scoop of ice cream or with a hot drink! Umm what?! Everything about this sounds delicious! I'm sipping on a hot chocolate just wishing I had a plate of these right now!! They look so scrummy! I'm normally a dark chocolate kinda gal but these sound pretty yummy. I like the spice combo. Such a great flavor combination - these cookies would be a huge hit anywhere, especially with those sweet little marshmallows! These look so fun for a winter cookie. Sounds delicious! I think I'm going to have to make these at some point. These cookies look so yummy and perfect for the holidays! Cookie recipes are in abundance this time of year. You have a great flavor combination. All the flavors in this cookie make it sound tasty. I love the presentation with the marshmallows sprinkled on top. I am already obsessed with Christmas and Christmas cookies, so these cookies have me drooling over here. These look so scrumptious! I'd have to modify a few things to make it vegan, but it will totally be worth it. Great for the holidays! I love chocolate kisses! Marshmallows on top it totally genius. This are divine, hot chocolate and cookies. Oh my, i have to try these. This looks great., instead of buying cookies, my younger daughter and I could do this and make little gift trays. Thanks for sharing. I love spiced cookies! Can’t wait to try them myself! You always impress me with your recipes. Always coming up with new things, I love it and this one is no different. Looks simple enough and delicious ! I am definitely a white chocolate girl! These sound delicious, I will have to give it a try, but I will probably swap out the regular chocolate kisses for white chocolate ones! these look super fun to make! These cookies sound delicious.. my fav is milk chocolate but I love white chocolate too.. The white chocolate cookies really look so tempting. The topping add to their allure and make them irresistible. Oh my this looks so good! I think these will be the perfect treat waiting for the ball to drop on New Years! Thanks so much for sharing this yummy reciepe. This is a nice home made cookie recipe, I'm not the best in backing but this sounds easy to make. Oh yummy yum yum these sounds amazing! I just love those cute little marshmellows on top of each one, they really make the cookie!! This looks yummy! I think these cookies are perfect gift ideas! I would definitely try this out one of these days! I personally prefer milk or white chocolate over dark chocolate although I know dark is supposed to be healthier. Your cookies are picture perfect and as usual, as with all of your creations, look so delicious! What an amazing combination of flavors! These spiced cookies are so good for winters! These look absolutely delicious! I am going to have to try these, I have a serious sweet tooth since the holidays! How did you know I liked choc chip cookies???? Oh my gosh, these look soooo tasty! 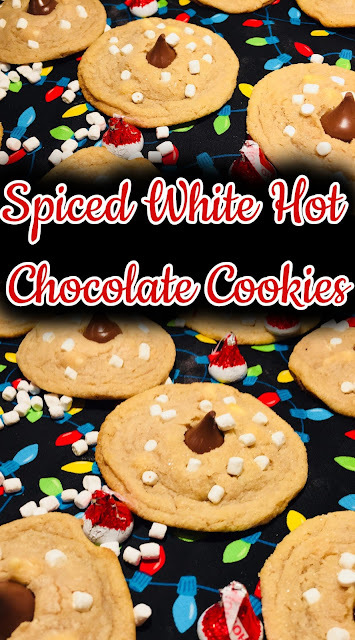 I love white hot chocolate, and I have a (more than) slight addiction to cookies, so this seems like a recipe I'm going to have to try ASAP!